Mom always liked Bburago better. 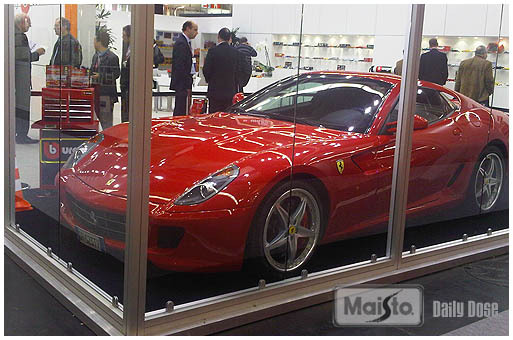 How else can you explain the fact that they get a Ferrari 599 in their booth at the Spielwarenmesse International Toy Fair in Nuremberg Germany last week? 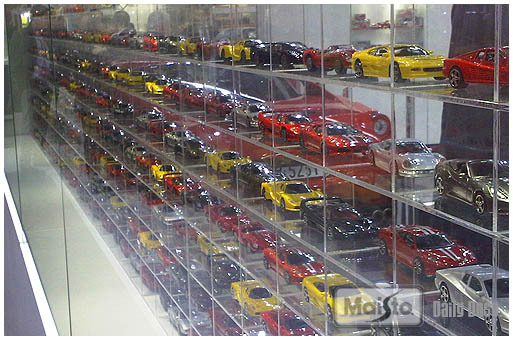 I mean, just cause the Maisto showroom is in a permanent hall on the second floor that does not have an elevator to accommodate a Ferrari, nor a way to get it down the halls, nor a door wide enough to allow entrance, so THEY get the Ferrari? Jeez. it was a show-stopper, to say the least. 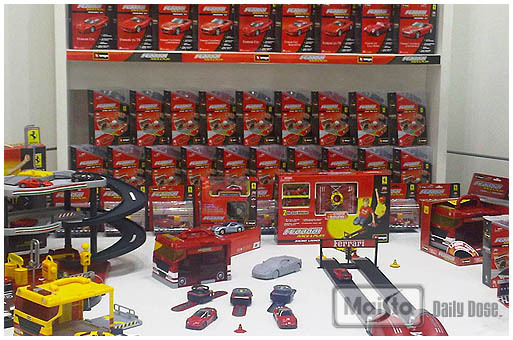 car enthusiasts were loving it, and toy enthusiasts were anxious to see the first new range of mass market Ferrari products in the last 10 years, thanks to our new deal with Ferrari that allows us to ship Cars with Playsets. and thanks for asking, but no it was not my car. we just borrowed it for the show. and one of these days, it would be nice to get the BBurago Blog up and going – til then, we will gladly rent our twin sister of a different mother some space, especially if they are sharing photos of sweet Italian rides. we are back from another successful trip to hong kong. the mood amongst customers was positive, given the state of the economy, and we are placing our outlook at level orange – cautious optimism. while there we are always ready, camera in hand, to take some photos that we hope you might find interesting. this next grouping of photos are snapshots of what is used to decorate the offices and showroom in hong kong. we hear from many people that the maisto/bburago showroom is one of the finest – not just product lay-out, but everything that goes into the look, the feel, and the style of the headquarters. some of the following is what gives it that feel. this next group is a little on the more esoteric side. when we were going through the Bburago facility, they had all sorts of interesting artwork – much of it incorporating actual die-cast pieces. it was all arranged in formation, then painted, usually a very bright color, framed. next. hope you enjoy the look inside our headquarters. 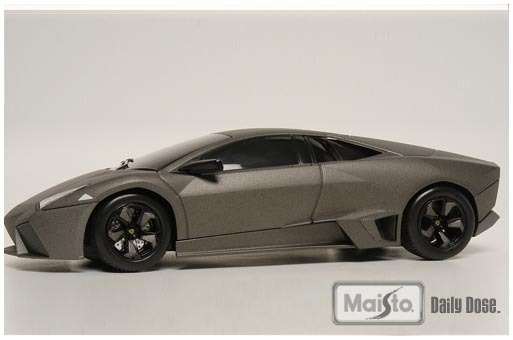 we posted last week a review of the 1/18 Bburago Lamborghini Reventon that appeared in the winter, 2009 issue of Die Cast X magazine. unfortunatley, we (as in I) could not get the damn thing to work in a pdf mode. i think we figured out the method now, and the downloadable version is here for your enjoyment. 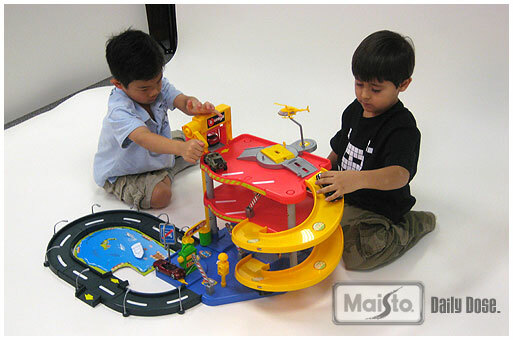 Yesterday we had to arrange a little photo shoot of a playset for Bburago, and yes we had to bring in the big guns! Not The Jonas Brothers, Not Brad Pitt, George Clooney, or Leonardo… We brought in Jake and Michael. Yes little Castro, and little Chu, son of super salesman Robert Chu! The game was set and the task was simple, get some good photos to use on a package. Jake was ready like a week ago, reminding me every day, are we going to work tomorrow dad? when Dad? when are we going to work? Well yesterday was the day and he was so excited! We both came in with our backpacks and started the work day! He was having a blast! 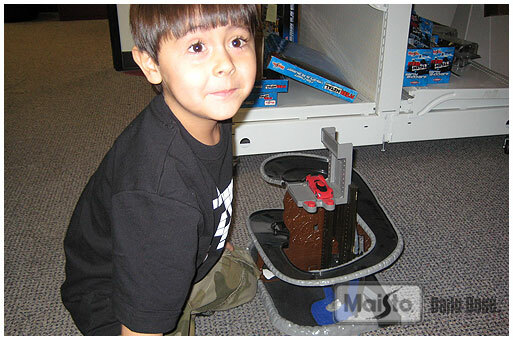 pulling toys out, grabbing cars off of desks, nerf guns, you name it! 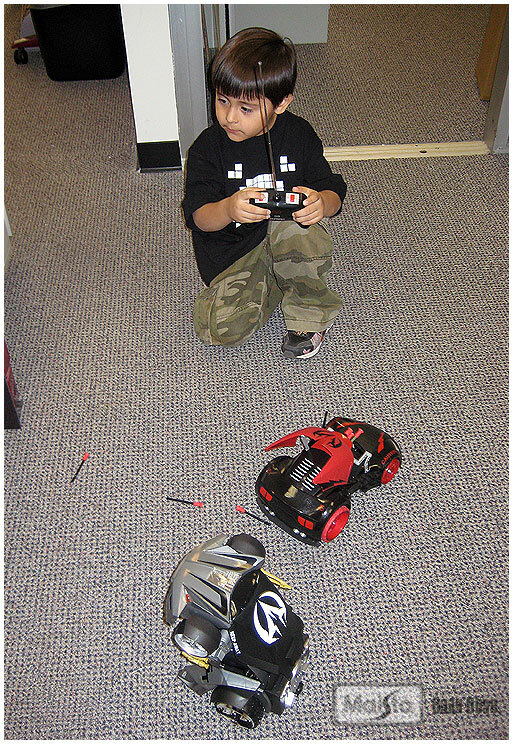 Here he is playing with some of the latest Street Troopers! So after he played a while, had lunch, it was time to go to work! Wait this isn’t work? Is it? Here’s some of the CAPD setting up the shoot. Making sure the pics come out nice! Here’s Michael and Jacob (the talent)! They had never met each other before, but hit it off instantly, they did just what any kids would do…they played! Completely ignoring the photoshoot set up and boring adults! Here’s a shot behind the scenes, Dimex filming for the DD and our youtube page. Also R2B2 and Charles in the background. These little guys had the best time! Here’s a view from above. And that was it! The boys did great, played the whole time, didn’t complain, and got hooked up with some cool toys and Maisto swag!!! I bet RHB wishes the design team was that easy to deal with! Yet another reason why I Love My Job! Sorry for the lack of updates folks, things have been pretty busy around the ol’ Maisto offices. Our annual global sales meeting is in full swing and 2009 product is rolling down the assembly line. Oh yeah there is still that BIG announcement! We’ll see what turns up around the corner, cause there’s really no NEED for us to keep beating around the bush! So things are speeding along and today low and behold a new package from HK. You don’t know the feeling a CAPD designer gets when something we worked on shows up at the office as a PPS (Pre-Production Sample). Then the even greater feeling to see it show up on the store shelves around the world! IT’S AWESOME! 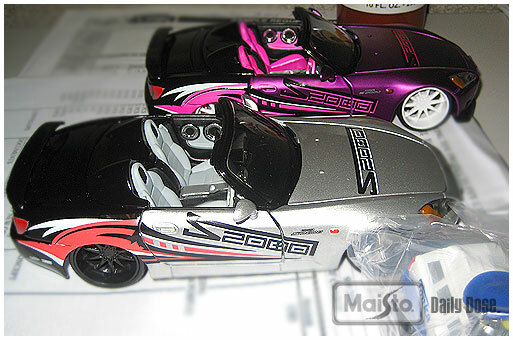 Here are some new Street Tuners decos from our Twin Sistah Bburago! 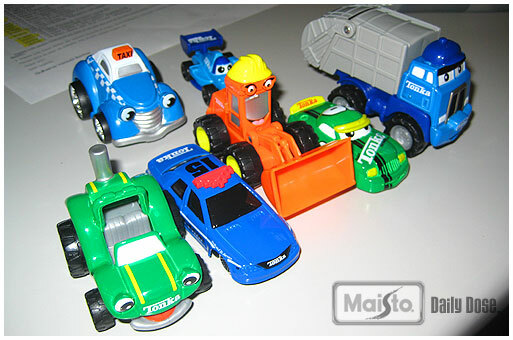 Also some sweet new Tonka decos! 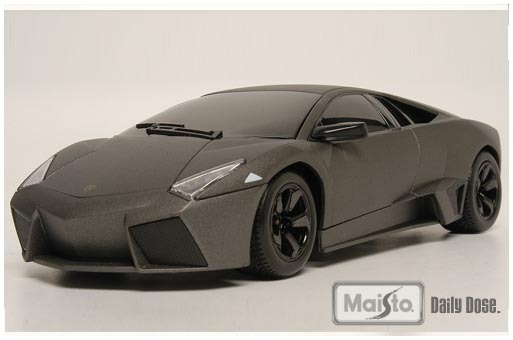 well bb has had all the fun as it relates to lamborghini’s famous and fabulous $1.5m reventon, building it in just about every scale imaginable. maisto has been left out, until now. 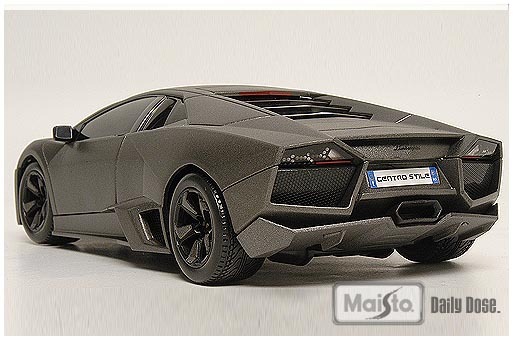 that’s right friends, the reventon is now available in 1:24 radio control! now you can experience all of the fun of owning one of the world’s most expensive cars, AND freely crash it into your garage wall by accident with little or no body scrapes. she’s a looker, that is for sure. 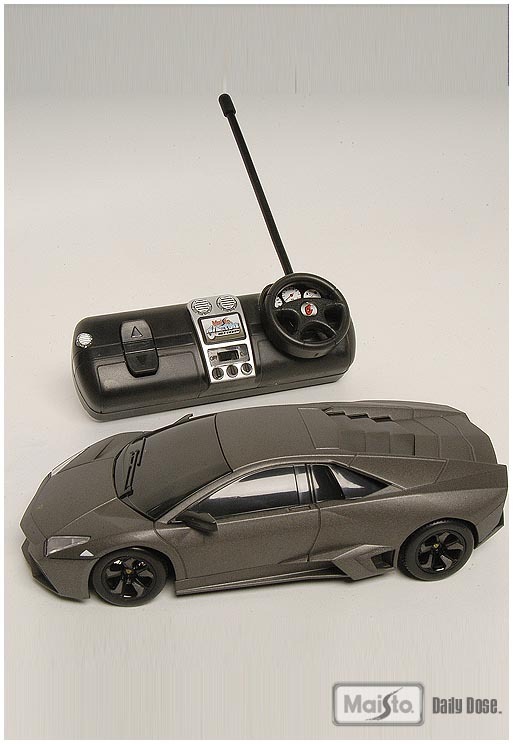 available today – the 1:24 radio control lamborghini reventon. ciao!